A LOCAL COMPANY THAT PUTS YOUR PROJECT FIRST. At Souris River Designs we have embraced technology to allow our company to flourish in the heartland of America. Our designs are world class, and our remodeling and sunroom jobs put us a step ahead of the other guys. Now is the time to see why so many have trusted our company with their project in and around Minot, ND. From 3D renderings to full kitchen or bath remodels, the team at Souris River Designs cannot wait to get started. If you are looking to design a home, or new reno, the only team you need to work with is Souris River Design. Bring beauty into your home's most functional spaces with out complete kitchen & bathroom remodeling. Brighten up your home with a new sunroom! We offer a complete selection of services & construction. Do you love your home but are limited on space? Don't move - check out additions & remodeling services. 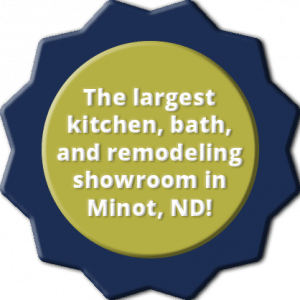 found a niche here in Minot, and have loved working with our great clients. Our in-house design staff can create the space that you have in your mind on the screen, and our builders are able to execute on these plans to create your dream space. With over 20 years in the industry, we cannot wait to create your next dream space in your home, all with the work of Souris River Designs. Although we are based right here in downtown Minot, ND, our service area stretches further beyond that. We are currently proud to serve as far north as Westhope, stretching all the way to the east to Rugby, to the west to Williston and as far south as Garrison. No matter where you live, the team at Souris River Designs will be able to get you the design build and remodeling jobs that you have always wanted. Call us today! Are you in the market for a bathroom or kitchen remodel, maybe a new sunroom, or just simply a design build? Well luckily for you the team here at Souris River Designs is here for you. Call or click today for a quote, and see what our team of leading designers and builders can do for you and your space!